Let me just get this out there straight up; this was the best kids’ club we’ve tried so far. My twins have experienced a few kids’ clubs in their nearly seven years, and they’ve generally been fairly reluctant, at least at the start. At Club Med Bali, they were genuinely asking to go back. Hooray!! We spend four days at the resort and they were in kids’ club for three of the four, for full days. Did I miss them?? Errr… cannot tell a lie… I loved that they were happy there. I did follow them around a fair bit taking photos, but also was freed up to check out all the facilities of the resort. Even the spa, all too briefly. I did it for my readers – honest injun. 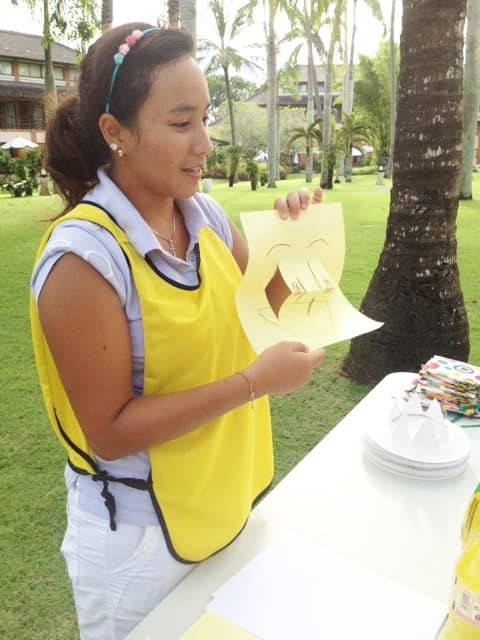 Here’s what you need to know about the various kids’ clubs and activities at Club Med Bali. First of all, the all-inclusive Club Med costs only includes care for children from the age of four years. Nannies are available for babies and toddlers, and children from two – four years can go to Petit Club Med, but these do cost extra. 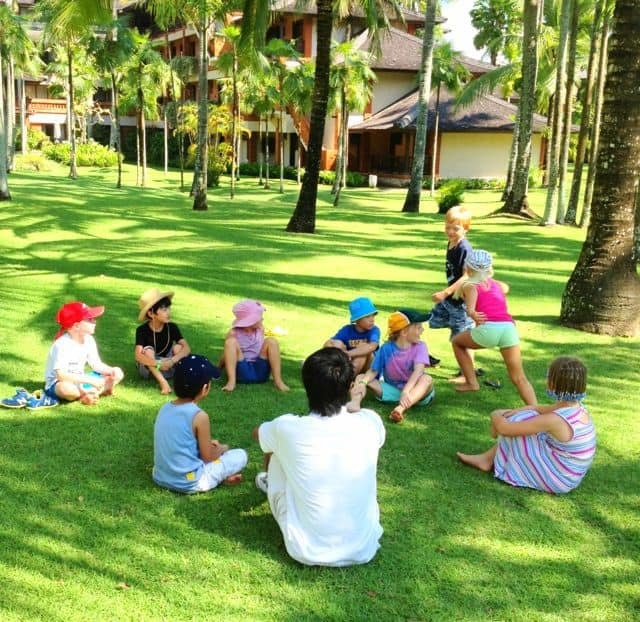 Baby Club Med caters for children aged four – 23 months. 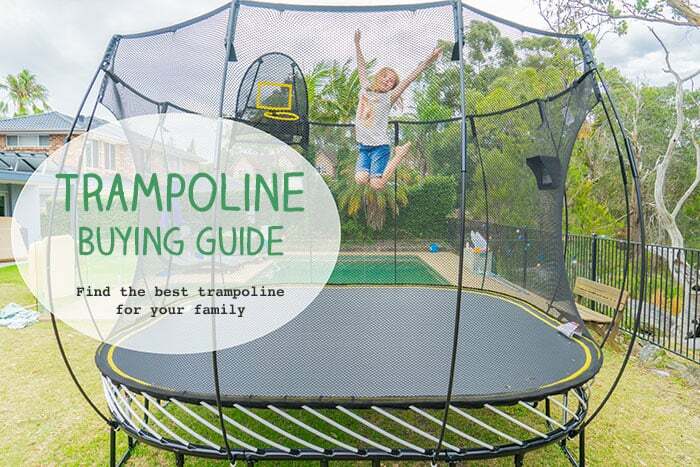 they can be looked after all day with a schedule of indoor and outdoor activities. 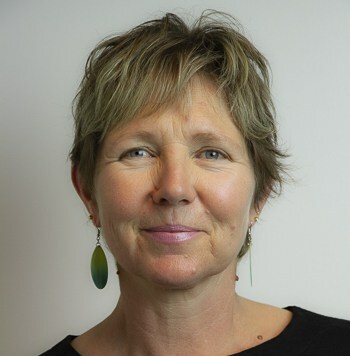 A dedicated chef provides baby-friendly meals. Young children also have a busy day, run to a regular timetable. 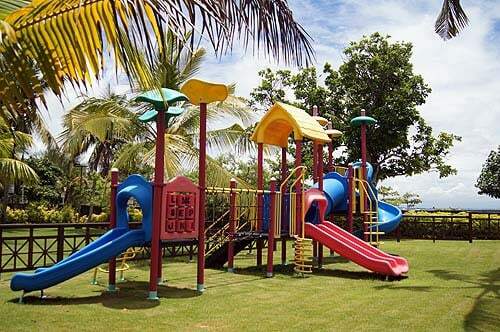 They enjoy activities and craft inside and out, there’s a splash pool to keep them cool and play equipment. After lunch they can have a nap or a quiet lie down time. The hours are also 9am – 5.30pm and 7.30pm – 9pm. Parents need to provide nappies and milk, if required. Rusty Rocket on a flying trapeze – wow! 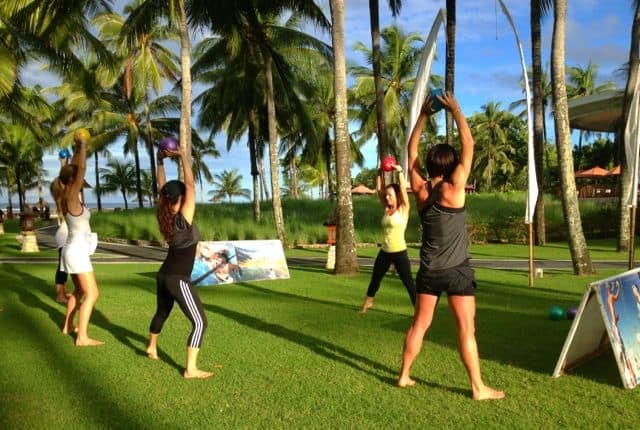 Mini Club Med is also open for two sessions 9am – 5.30pm and 7pm – 9pm. Our previous kids clubs had always had a lunchtime break and it felt hard to get anything done in the short blocks. 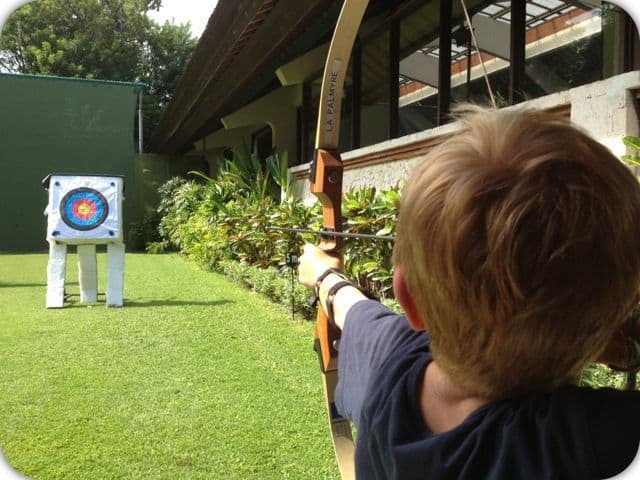 At Club med Bali t felt good to know that the kids were busy all day. A rare sense of freedom! It means parents can go out for the day if they’d like to do something that the children can’t do. Or just lounge around the adults only pool and suntrap. No, I didn’t this time but I will next…. 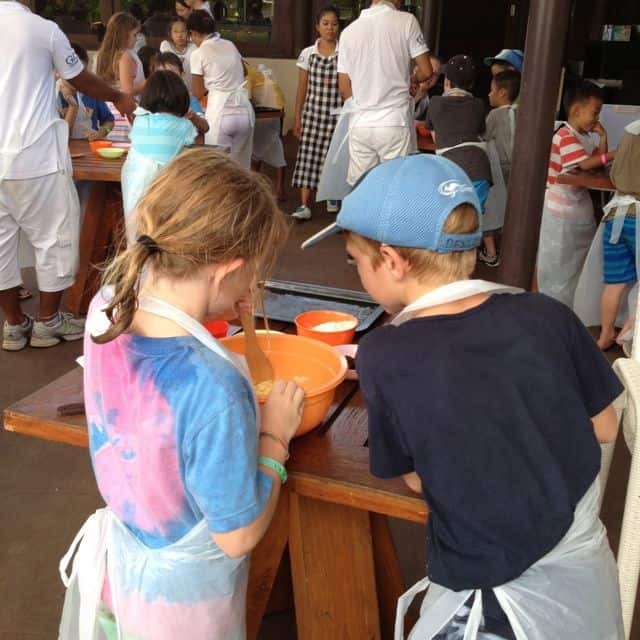 At Mini Club Med, each day is tightly timetabled, here are some photos showing what is on for a couple of days. You’ll see there’s lots of physical activity and that meals are given pretty early, which suits my two. 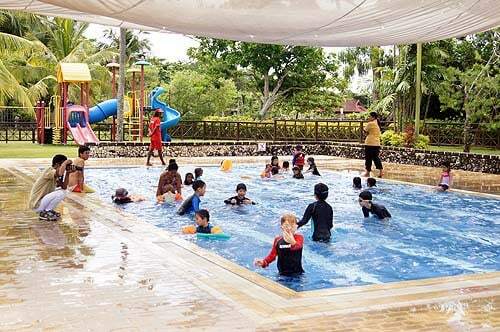 Kids need to bring swimmers, hat and sun screen, sports shoes and extra clothes. 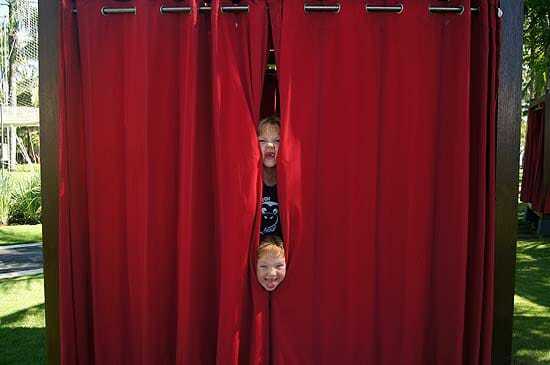 My twins’ favourite activities were the archery and the circus skills, especially the flying trapeze. I liked the fact that the GOs looking after the children were numerous and full of enthusiasm. Also that the children were split into groups by age. 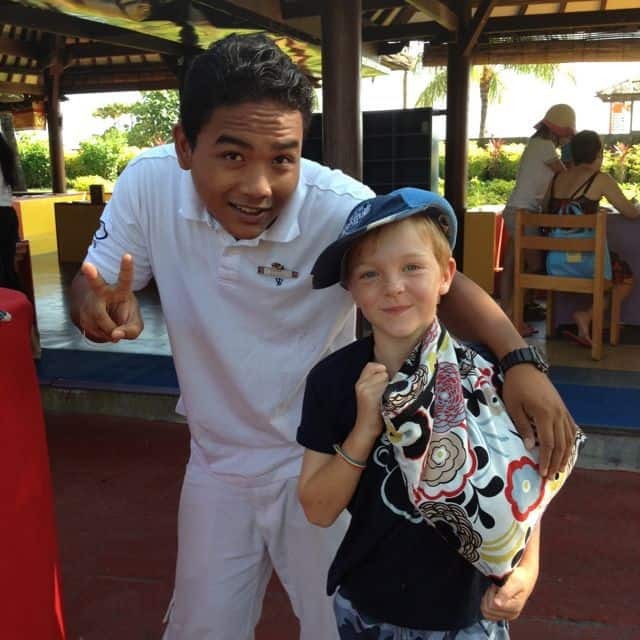 We visited Club Med Bali during the school term, and I guess it will be much busier during the Aussie school holidays. My children wouldn’t like to wait in long queues in the heat, and I wonder whether this might happen when it’s busier? Trying archery, the twins loved this. Now, I didn’t have my teens with me, but had a look at the teens area and heard a bit about their Club. There are lots of activities on offer, and teens can come and go as they please. Both my twins enjoyed all the craft they did at kids’ club. 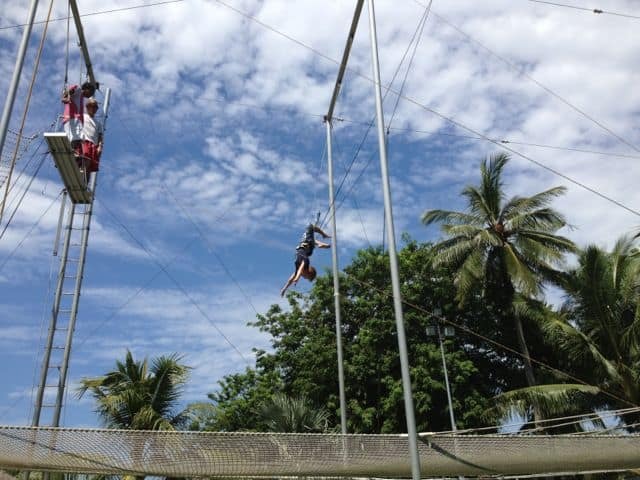 Of course there are many, many family activitities on offer too.When the twins and I had a day together we enjoyed some archery again and more flying on the trapeze. And the obligatory hours and hours and hours in the pool, of course. 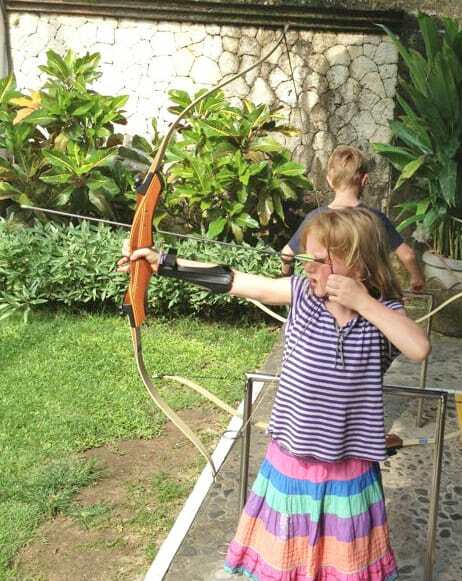 My wee girl looks fierce with that bow and arrow! Not really any that I can think of with the Kids’ Club. I was really impressed, especially with how lovely the staff are and how many were around. OK Any Downsides At All? The time difference did cause us a bit of hassle. Bali is three hours behind Sydney, so my two went to bed very early on the day we arrived. Then Rusty Rocket woke up at 3.30am Bali time the next morning. Oh joy – not. He adjusted by the next night thank goodness. The evening buffet meal which starts at 7pm Bali time (10pm Sydney Time) was just too late for us for the first two nights. We ate happily mid-afternoon at the a la carte Batur restaurant. The shows in the theatre start after dinner and the twins would love to have gone but just couldn’t stay awake long enough for the first three nights. Next time we must stay longer! 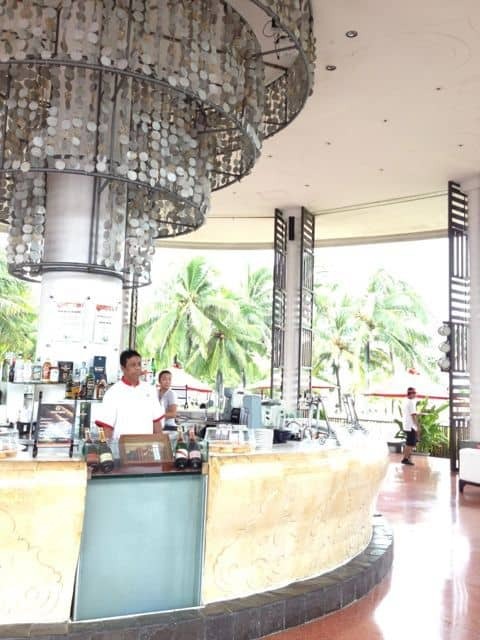 Have you been to Club Med Bali too? 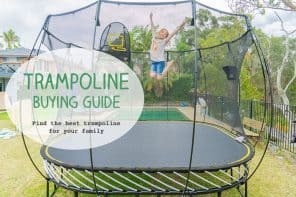 Any kids club you can recommend to other parents? 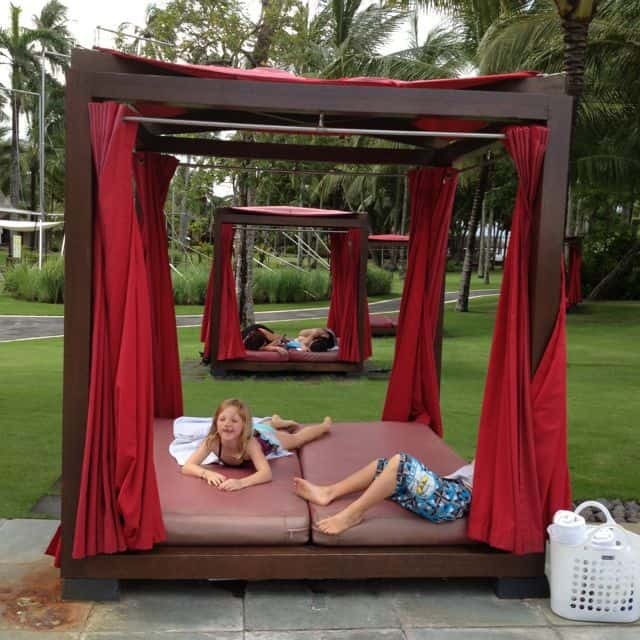 We stayed as guests of Club Med Bali, who also paid for two of our three flights. Many thanks Club Med Bali. 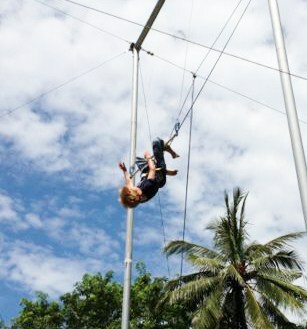 Especially big thanks from this amazing young man on his flying trapeze, he’s keen to join a circus now. 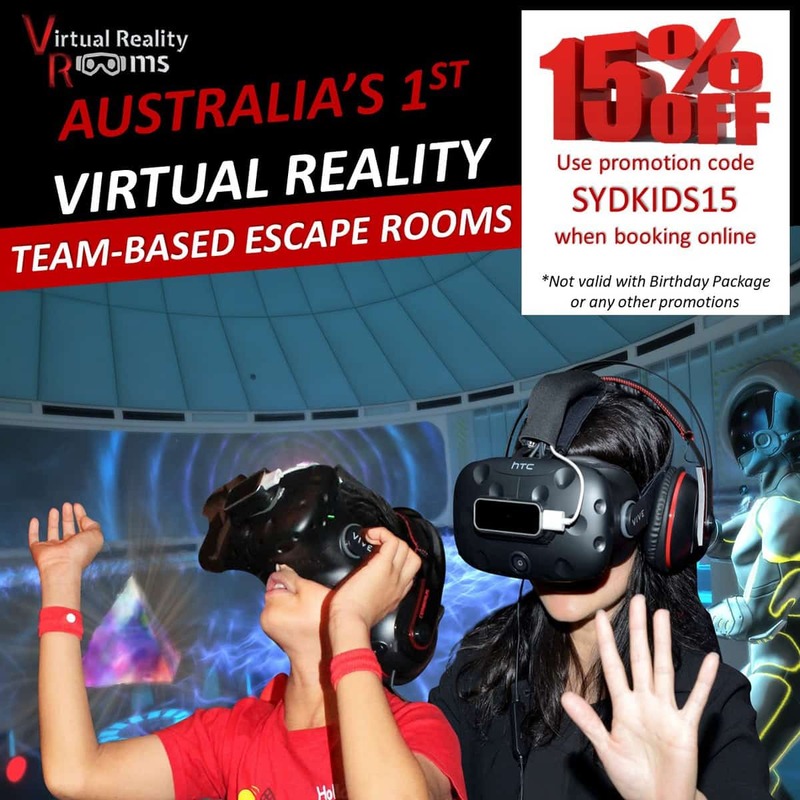 Every mum needs a good kids club when on holiday. Looks like loads of pluses but as you say time changes can be difficult for the first day or so. I love that there seems to be so many interesting things to do. 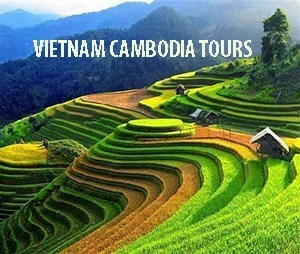 You are making me want to book. Yes, loads to do, and there’s a whole watersports area too which I didn’t even get to. 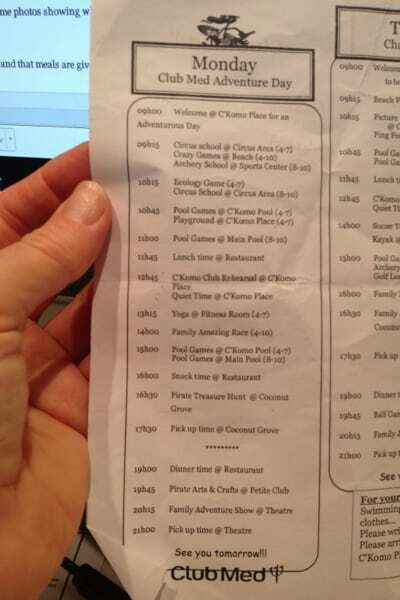 Next time… I’d love to go with my hubby and all the kids – would cost a lot but be a real holiday. Or just hubby, twins and I when boys are a bit older would be great. Or just you and I Carolyn??!! 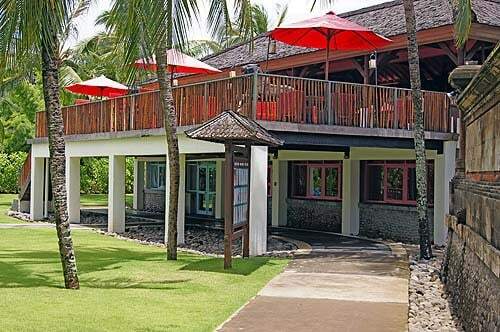 Bali Club Med has just raced to the top of my places-to-stay list! Sounds like a truly wonderful time for all! I totally wish I was back there Kirsty, that wristband means food and drink appears effortlessly, no shopping, preparation or washing up. Sadly it only works there, I tried wearing the same band at home – Nothing!! Yes, I think it’s easier for the twins to go together. But they always split up and make their own friends. All kids need a bit of encouragement don’t they, but after about 5 mins they’re off and happy. 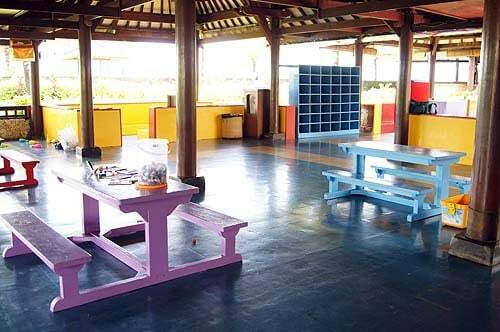 The last time I was in Bali, my son did not want to go to the kids club. Next time, I think I need to go to Club Med! This kids club looks awesome. 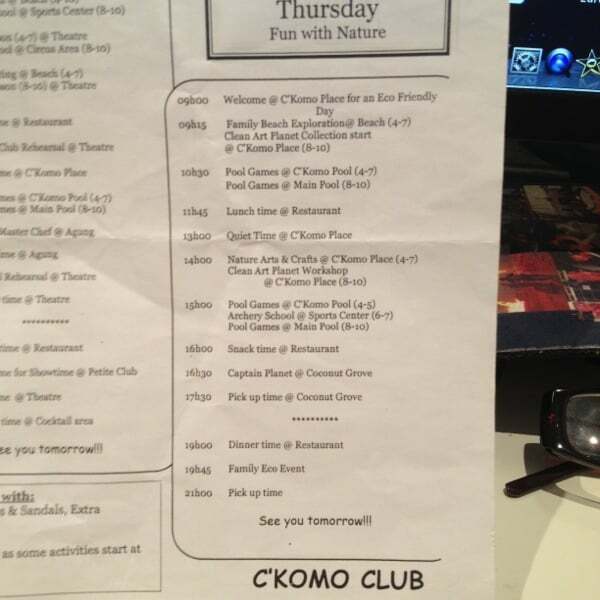 I can’t wait until we go to Bali and try out our own kids club this month. 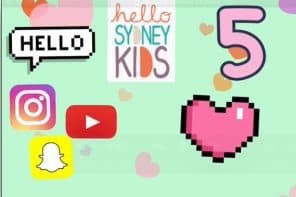 Hope Miss 4 likes it! I might look at club med for family friendly holidays. Oh where are you going?? Will you blog about it? 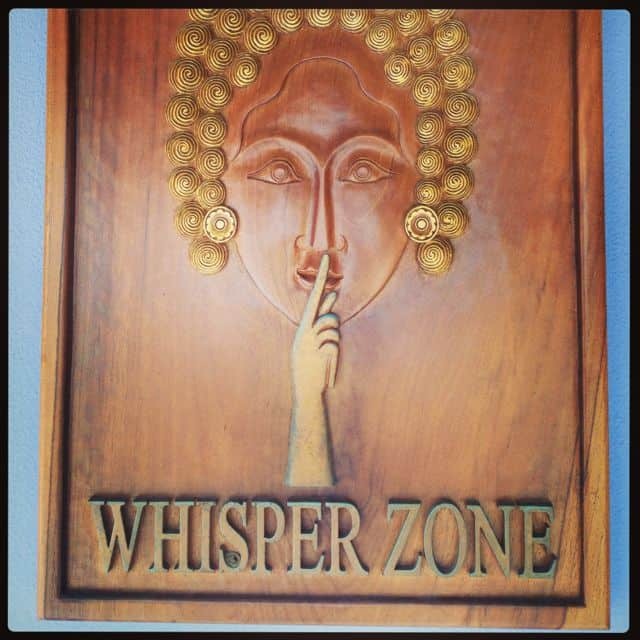 Guest post here!?? I am always keen to hear detail about kids clubs. We are off to Sanur Paradise Plaza and the Safari Park Lodge. What a wonderful experience for you all. Looks like a fab place to stay. 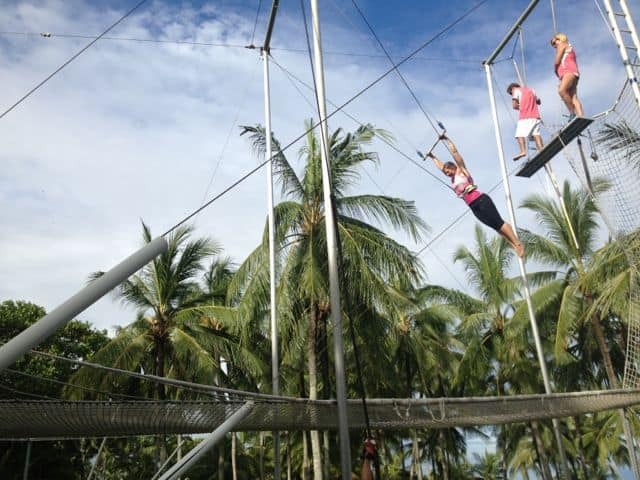 My husband worked in Club Med years ago and from what he told me, it is one most happening hotel with tons of activities for the guests. I am always intrigued to try to stay there but maybe in Bintan because Bali is like our second home where most my in laws are. Yes, I must say that was a very lovely way to do it. But it was too short!! Have you posted yet about Yabuli, I’ve never taken the children all skiing, all-inclusive would be a great way to go. 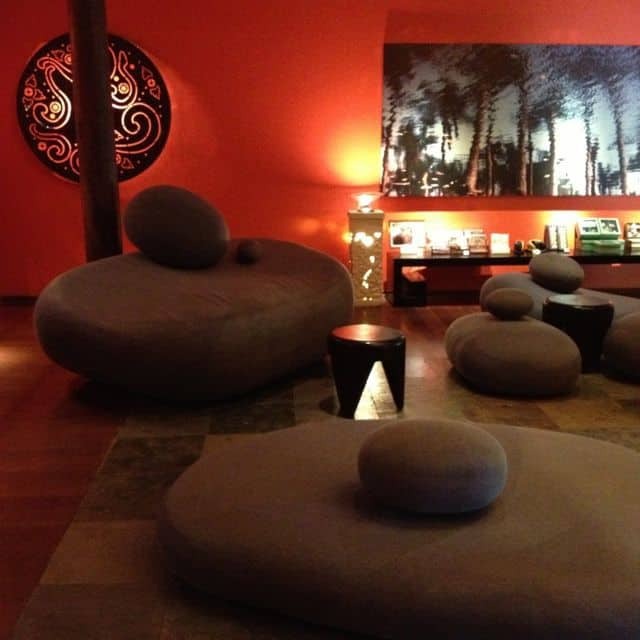 Hi Seana,Yep, I did post about Club Med Yabuli – in my March archive. An all inclusive ski holiday is definitely the way to go. I have never thought about staying in a Club Med but I want to now and we are actually going to Bali at the end of the year. A shame kids club is not free for under 4s though as my youngest is only 2. I also wish there wasn’t so much age grouping at these types of things, as my kids always want to be together. I guess that is one of the pluses of twins! 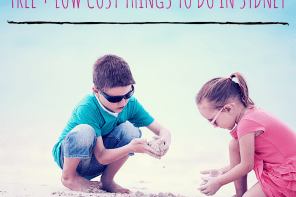 My other kid will be 4 – so I guess it may be possible for them both to go to Petit Club Med but then I guess we would be stuck paying for the 4 year old as well?